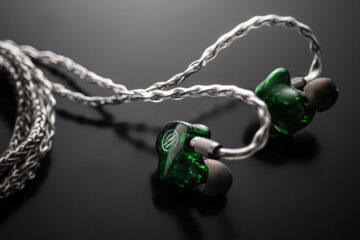 Earsonics are a relatively inconspicuous brand in the mainstream setting but have slowly earned their place within the audiophile scene with their polished house brand and signature IEM styles. One of their first adored models was that of the SM3 which was quickly surpassed by the SM64 as a flagship status model. With this model alone, it was clear that Earsonics was going to be a special brand and one that would remain in the audio scene for a long time. Earsonics had then released a universal IEM touted the Velvet which further upped the ante with its incredible sound tuning capabilities. Their research and development into the field of crossover technology and their advancements in the implementation of multiple drivers have also been welcomed changes that have helped to propel the French audio brand. Recently to have been released, the €219 SM2-IFI comes as a two-driver operation which Earsonics have claimed to represent high end audio listening at a more affordable cost. 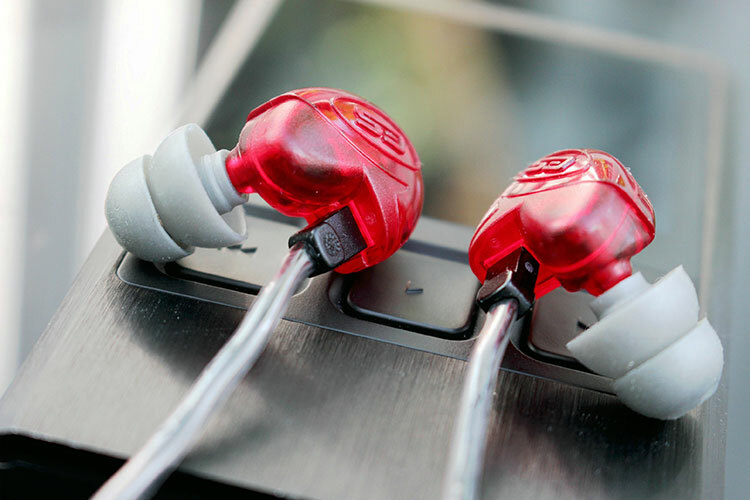 Utilising a 2-way cross-over design and large architectural transducers, the IEM has been said to provide a larger headroom with a quality sound. Without further ado then, let the review commence. 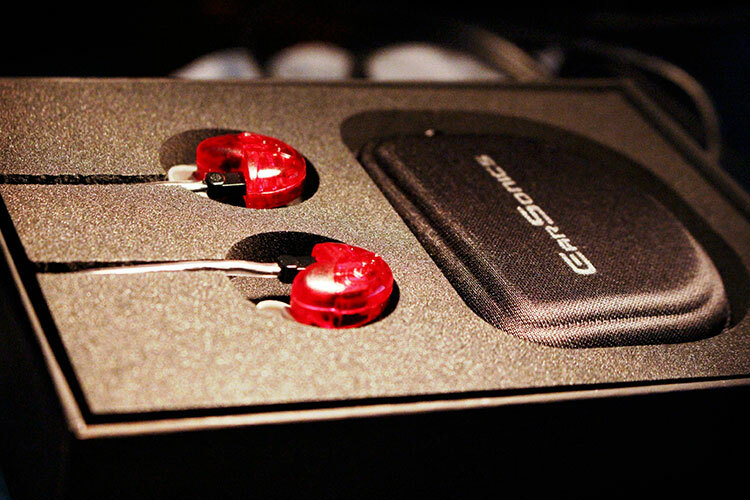 The Earsonics SM2-IFI comes in a matte black box with the cherry red IEMS resting on the signature foam inserts. Customary of Earsonics, there are several different sized eartips including 2 pairs of black silicone double flange tips, the provided grey double flange tips, 2 pairs of foam ear tips and a pair of flat blunted tips. Also included is an earphone cleaning device which along with the other accessories are all housed in a small clamshell storage box. It is clear to see that the polished Earsonics brand has retained their house styling and any packaging material of theirs would be instantly recognisable as pertaining to that of the French brand. 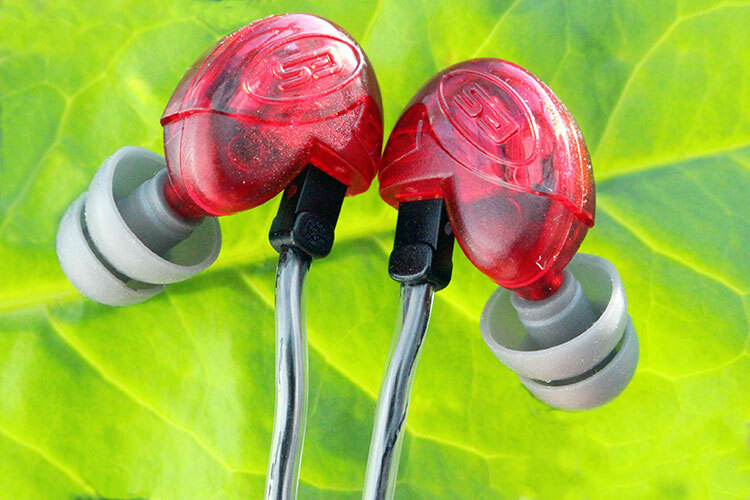 The SM2-IFI adopts a cherry-red translucent plastic housing which reveals the architecture within the 2 driver IEM. The build appears to be durable with a body that is not too smaller than that of Earsonics Velvet. Both the memory cable and the cable itself employ a dual braided design which looks and feels resistant to the wear and tear from the daily commute. Both strain reliefs (where the memory cable inserts into the body of the IEM) and the Y-split also look to be of good durability which would definitely aid the life of this product. Like the Velvet, Earsonics have made the SM2-IFI an ergonomic experience to provide the user with a comfortable product. The experience is very similar to the Earsonics Velvet, in that the shape and size of the housings of both alike. In this regard, the SM2-IFI rests well against the ears with no irritation or looseness experienced. The memory cable aids in this aspect with its firm hold securing the device into place. 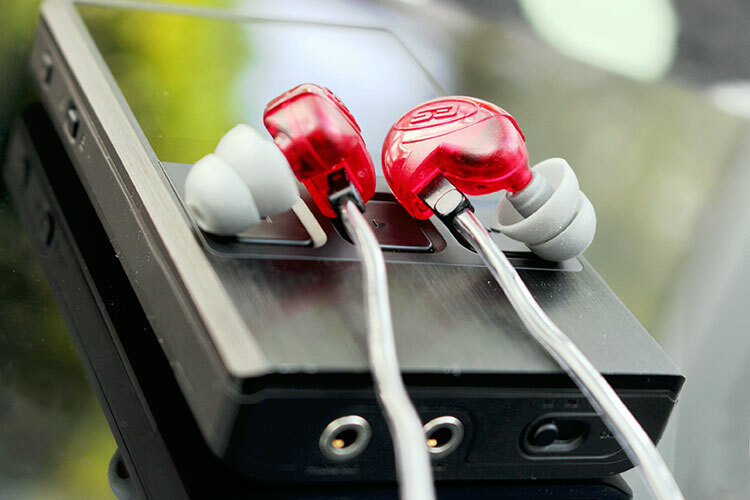 Isolation levels were also beyond average, especially with the double flange tips which work well in reducing ambient noise and allowing you to focus on just the music. Compared to the impactful and deeply extensive Earsonics Velvet, the SM2-IFI falls short in both regards. That is not to say however that the bass is anaemic though, because it is certainly present. It is just to say that the Earsonics Velvet does an outstandingly amazing job of portraying controlled yet effective bass slams. With regards to the SM2-IFI however, there is more of a mid-bass presence than sub-bass which like the Velvet, appears well-proportioned and within keeping of the rest of the frequency spectrum. Compared with the DUNU DN-2000, mid-bass levels are similar with effective extension and depth. Sub-bass however, is more extensive on the DN-2000 with a fuller bodied and more impactful sound compared to the slightly rolled-off SM2-IFI. Both adequately portray very decent bass with the SM2-IFI having a noticeably tighter and more articulate lower-end spectrum. The midrange of the SM2-IFI takes on a slightly laidback presentation with a satisfying and pleasant tonality. 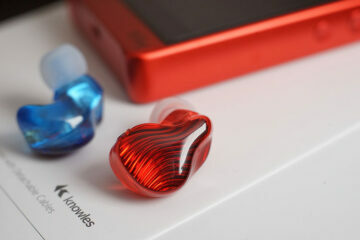 Detail levels and resolution are very good; a characteristic of Earsonics’ house sound. Also distinctive of the company is the upper midrange recession that is partly responsible for the lack of sibilance and harshness within this part of the frequency spectrum. Low to mid transition is seamless and the SM2-IFI handles transients very well. Vocals here carry a generally warmer-than-neutral sound which provides a contrast to the DUNU DN-2000J’s brighter and more forthright tonality. Like the DN-2000, however, vocals are large and more enveloping than that of the RHA T20’s. The treble is rich and airy with superb extension. I am particularly impressed with the smooth yet warm tonality that is pleasing to the ears. Some may hear a peak in the mid-treble region though I do not find this to be harsh at all or grainy in character. Instead, it is effortless with good detail, clarity and bite. Compared to the DN-2000, the treble here is more forward with a discernible peak compared to the former’s laidback top-end. The Earsonics SM2-IFI has a spacious presentation with good projection of sonic cues in the dimensions of width, height and depth. In comparison to the soundstage of the DUNU DN-2000, the SM2-IFI has a more central vocal-forward approach with less width than that of the DN-2000. Depth however is much better on the SM2 with a more 3D presentation of sound that is often lacking on the DN-2000. Instrument separation is also very good with clear layering of instruments and vocals within the soundstage. As a whole, the SM2-IFI is much more efficient than the Earsonics Velvet and does not really scale up with bigger and more powerful amps. They may however benefit from having a larger headroom and perks such as bass-boosting. Coupled to this set-up, the soundstage of the SM2-IFI picks up a bit with more of a sense of refinement and body to vocals. These differences are very subtle though and you would find it hard pressed to notice much of a difference against a normal decent soundcard aboard a laptop. Overall, the Earsonics SM2-IFI is a solid entry level model that replaces the SM1 in Earsonics’ now extensive line-up. The overall sound signature can be described as being mid-bass dominant with a spacious yet laidback mid-section and a rich and airy treble. Like the Earsonics Velvet, the SM2 is devoid of any harsh peaks and sibilance whilst still retaining good resolution and detail. Packaging remains outstanding and is the sign of a truly polished and established brand. Durability is a factor that was also well implemented with a strong and durable design. What perhaps could have made this model better, sound wise, would be more clarity in the vocals and a more expansive soundstage. However, for the number of drivers this model has to work with, the sound does better than expected. Thus, taking all factors into account, the SM2-IFI performs very well for its €219 price providing good competition to the RHA T20 IEMs and DUNU DN-2000. I look forward to what Earsonics has next in store. Can you compare Dunu T5 and SM2 iFI? Amazing images, what camera or lenses are those? Thank you.. I used a Canon EOS 700D w/ stock lens believe it or not..
Well that too but as you know Nathan wrote reviews on most of Earsonic’s line up..